Wednesday March 31st marked the end of the Life and Legacy of Jeannette Rankin Program Series…at least for now. 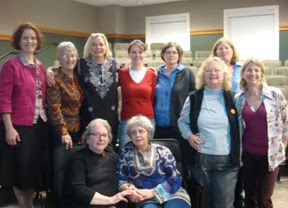 The JR130 Committee and co-sponsors hosted six successful events during Women’s History Month 2010 in celebration of the 130th anniversary of Jeannette Rankin’s birth. Each event shed some light onto Rankin’s life and provided contemporary viewpoints on many of the ideas she was devoted to during her political career and years of activism – peace, anti-isolationism, participatory voting, and fair labor practices. Yesterday afternoon the final program, called “Workplace Justice Then and Now” brought an energetic close to the Committee’s efforts. Dr. Pamela Voekel, Professor of History at UGA, started the program with some perspectives on Jeannette Rankin and her ties to the fight for fair labor practices during her first term in the U.S. Congress (1917-1919). Voekel recounted Rankin’s attention to the sexual harassment and overwork of female employees at the U.S. Government Printing Office – how she invited the women into her Washington, D.C. apartment to develop a plan of action and then advocated for their rights -- for fair labor practices and working hours-- on the floor of the House. Voekel recalled Rankin’s decision to side with mine workers of the Anaconda Copper Company in her home state of Montana, who initiated a walkout following a massive mine collapse which killed more than a hundred workers. Though Rankin knew she was committing political suicide, siding with workers against business interests which dominated the state, she defended their right to fair pay and safer working conditions. As a result, Rankin was not re-elected to a second term in the House. Led by a local musician on guitar, the audience launched into a few verses of the famed labor song, “Solidarity Forever” (set to the tune of the “Battle Hymn of the Republic”), aided by helpful lyric sheets. Bethany Moreton, a Professor of History and Women’s Studies at UGA followed Voekel and shared a great overview of labor struggles, particularly those of women and African Americans, from the New Deal through today. After this overview, Moreton focused on some stark examples of economic disparities present in the U.S. labor market She pointed to the fact that while the level of education for Americans is increasing, the pay scale is not – indicating that many Americans with a college degree or higher will end up in low paying, benefit free jobs. Outlining the outcomes of recent wage theft cases against corporations like Walmart and IBM, she pointed out that worker exploitation isn’t something limited low-wage positions, but is a threat to those in white collar jobs as well. In the end, Moreton appealed to the crowd with a simple question: why not make the jobs better? If we can’t guarantee that everyone will get their dream job after completing high school, college, or even graduate school, can’t we at least try to make sure that all workers are well compensated for their work and receive benefits? For many college students facing graduation in a few weeks and many recent graduates who have been unable to find great first jobs Moreton’s appeal resonates in a new way than in better economic times. At the conclusion of the program, both presenters described efforts at the University of Georgia and other schools across the southeast that are making them a regional force for activism. Students from the Living Wage Coalition spoke briefly about their work on campus to raise the wages of University employees and invited attendees to an upcoming rally being held on campus next week. Though the facts presented during the talks were sobering, the presenters brought great energy and hopefulness to the topic . Certainly, everyone in the room left with much to think about, especially in terms of the plight of the local community and campus. 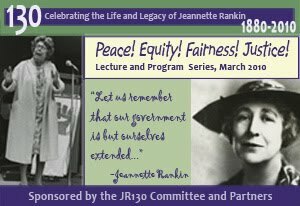 As we face the end of the program series, the JR130 Committee is hopeful that attendees will do what Jeannette Rankin did at the end of her political career – keep moving forward. Rankin was an activist who traveled extensively until her death in 1973 (at the age of 92!) and continued to advocate for the causes she believed in, always looking forward to new challenges. JR130 is planning more events for the coming summer and fall – so keep your ear to the ground! JR130 committee with generous support and assistance from the following co-sponsors: Jeannette Rankin Foundation, Athens-Clarke County Library, Oconee County Library; and the following University of Georgia Units -- Institute for Women's Studies, Willson Center for Arts and Humanities, Richard B. Russell Library for Political Research and Studies, Hargrett Rare Book and Manuscript Library, Department of History, and Women's Studies Student Organization.